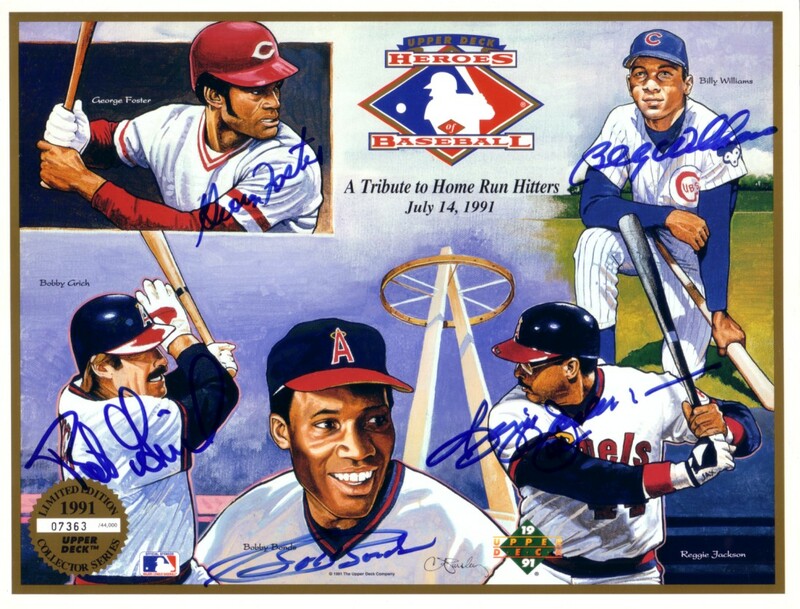 A Tribute to Home Run Hitters 8 1/2 by 11 inch commemorative card sheet distributed by Upper Deck exclusively at the July 14, 1991 California Angels home game, autographed in blue marker by former Angels greats Bobby Bonds (deceased), Bob Grich and Reggie Jackson; plus Cincinnati Reds great George Foster and Chicago Cubs Hall of Famer Billy Williams. Has minor wear. Obtained in person. Completely signed sheets are extremely rare. With certificate of authenticity from AutographsForSale.com. 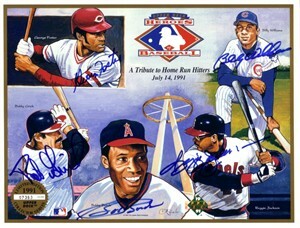 ONLY ONE AT THIS PRICE AVAILABLE FOR SALE.